Paddy Power vs Ladbrokes vs Bet365: Choose your bookie here! At Betminded, we bring you fair and impartial reviews of the top bookmakers out there. Paddy Power or Bet365 or Ladbrokes can be a difficult choice at the best of times, as all three are well-reputed for betting and gaming. We’ve taken a fine toothcomb to look at the strengths and weaknesses of each and recommend which to choose. For a summary of the ratings, see the table below and read on for more in-depth comparisons. Paddy Power have a wide range of sports to bet on, as you would expect. Their tennis markets are second to none and they have great coverage of GAA sports, staying true to their Irish origins. Paddy Power have long been known for their quirky sense of humour, and they take a lot of novelty bets on subjects like the next Pope or Archbishop of Canterbury. Football betting is extensive, with over 100 markets to choose from on most games, but that’s pretty much par for the course these days. You can tell that Bet365 are a real international focused bookmaker because they have markets on Scandinavian sports like bandy and floorball, as well as a lot of Australian racing events that you can’t bet on in most places. When it comes to the range of markets on different events, they are hard to beat. One of their specialities on football betting is Asian handicap markets, which they cover more in-depth than any other bookmaker we know. For an advanced bettor, it’s a great choice. Ladbrokes are a bit of a mixed bag when it comes to betting markets. For some popular sports, like F1 and cricket, they had the best range of bets available. They are usually get their odds up a few days before an event starts, which is a good thing for those who like to plan their bets ahead and perhaps get a bit of extra value. Tennis seems to be a bit of a weak area, with limited pre-match markets available even on the day of the game. It’s really difficult to split the top bookmakers when it comes to betting markets on football. Most have roughly the same markets available, with a few subtle differences but nothing surprising. So it comes down to other major sports like tennis, golf, cricket and Formula 1. Bet365 has the best overall offer, with no real areas of weakness. To compare odds between these three top bookies, we looked at odds for a round of Premier League matches in October 2016. The odds were taken on the Friday afternoon preceding the weekend’s action. Paddy Power was the weakest performer in this area, with only 11 best-price selections out of a possible 30. In a few cases, they had the best odds on outsiders, like Everton at 6/1 away to Manchester City and Burnley at 9/1 away to Southampton. However, in a lot of cases, betting on Paddy Power would see you give up a few quid in potential returns. Ladbrokes performed marginally better than Paddy Power, with the best odds on 13 selections. These were spread across the board, with 6 away wins, 5 home wins and 2 draws. Ladbrokes don’t have the best reputation for odds, but they do offer a lot of daily boosts which can help get you some extra value. These are mainly on football but they also touch on other sports like tennis and ice hockey too. Don’t forget, they also have a separate exchange which not many bookmakers do. It’s worth checking out as the prices will likely be different to those on the sportsbook. That brings us to Bet365, who once again live up to their reputation as the top online bookmaker for betting odds. Incredibly, out of the 30 selections we looked at, they have the joint or lone best odds on 24 of them. Even in the cases where they didn’t have best odds, they were only beaten very slightly. It’s a testament to how many people are betting online with Bet365 across the world that they can offer such competitive odds. So there is no need for a photo finish when it comes to odds. Bet365 runs out the clear winner while poor Paddy and Ladbrokes are left fighting for scraps. If odds are what counts most for you, then you know where to go. Paddy Power’s sports betting app is well designed with easy navigation, so you can access most popular betting markets at the touch of just one button from the home screen. 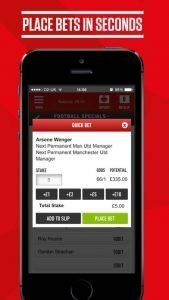 Plus, the innovative Paddy Power Messenger app (separate from the main sports betting app) makes placing bets from your phone even simpler as you can send simple text instructions to get on. We’ve heard of text betting services before, but a dedicated messenger app is pretty unique as far as we know. Ladbrokes is a great bookmaker, but their mobile betting services seem to let them down somewhat. Their apps get a bit of a kicking on the App Store compared with other bookmakers of similar standing. 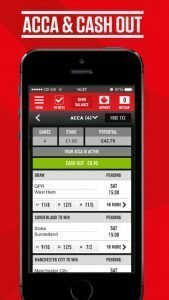 Some users have complained that not all markets can be found on the app, which is of course inconvenient if it affects the bet you want to place. 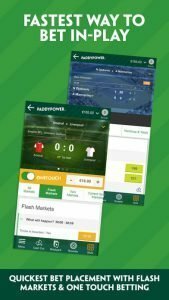 There is a separate app for exchange betting should you wish to use that service. 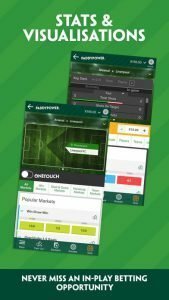 Bet365’s mobile app has a reputation for being very functional and easy to use. OK, it’s not the best looking out there, with an unattractive colour scheme of green and grey like the website itself. 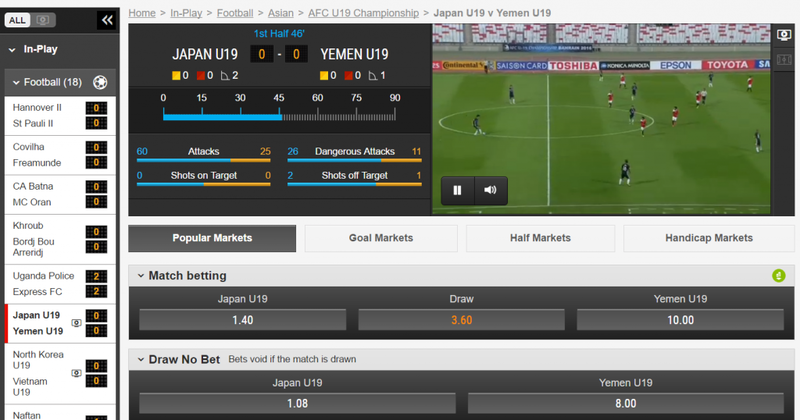 However, it’s definitely intuitive and even a first-time user would have no trouble placing a bet. What’s more, you can get all the best of in-play betting on your handset. It's tough to pick a winner in this category as Paddy Power or Bet365 are both good options. However, Bet365 stands out just in front as having the best mobile betting. 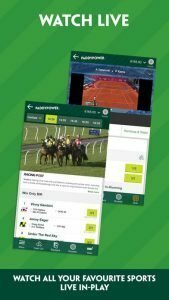 When placing bets on your smartphone or tablet, having a hassle-free experience is really important, and you can’t go wrong with Bet365 on that. Paddy Power also impressed but Ladbrokes were disappointing on mobile. Paddy Power allow you to bet on and watch a good amount of sporting events on their website. In addition to all UK and Ireland horse races, for which you’ll need to meet the minimum required bet to watch, there are lots of other sports events which are free to watch as long as you have a positive balance in your account or an open bet. These include European football and a lot of tennis tournaments outside of the Grand Slams. The live betting and streaming interface could use a bit of an upgrade to a more modern design. In the past, we’ve criticised Ladbrokes for not showing many events on live streaming, but they seem to have upped their game of late, with a lot of decent quality European football. When we checked this time, there were top division matches from Spain, France, Holland, Belgium, Poland and more. 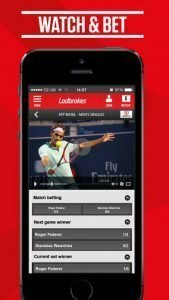 What’s more, Ladbrokes have a great in-play and streaming section on their website, which lets you easily toggle between all live betting events and live video. As you can see, there are also live stats to help you follow the game. Bet365 also has a great customisable live betting setup for desktop users, allowing you to drag and drop the events you wish to follow, then arrange them on the screen as you like. The range of in-play betting markets is solid too, with plenty of options for getting a piece of the action live. Just remember when trying to watch a live stream with Bet365 that you must have funds in your account or have placed a bet within 24 hours. Your access to the service may be affected by geographical restrictions. It’s tough to pick a winner here but we’ve plumped for Bet365, just ahead of Ladbrokes. Their interface for live betting is really creative and you’ll find just about any kind of betting market you could be looking for. So after what we imagined would be a closely fought battle, in the end Bet365 runs out as the clear overall winner. They didn’t have a huge winning margin in all categories, but consistency pays off! Betminded » Online Betting guide » Paddy Power vs Ladbrokes vs Bet365: Choose your bookie here!